VUmeter: Check the level of your digital recordings! Check the level of your digital recordings! Did you ever record beautiful music to discover later on that the recording was too loud and distorted? Well I did! therefore I wrote a program that let you control the digital recording level. 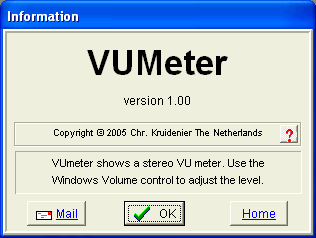 The program is called VUmeter. It runs on W95/98/00/XP/NT. VUmeter shows the levels of your digital audio recordings. The scale has markings at -3dB and -10dB. The scale runs to -50dB. After starting of VUmeter the mainwindow is shown: Now you can check the current recording levels. Use the Windows Volume Control to adjust the volume of the input channel you are using. There is only one button on the window; the Information Button. Click the "Author" button in the About Window to get information about the author. The program VUmeter is free. Do you like it, tell it your friends and send me a small donation in order to make it possible to continue this work and to improve my programs!. Something to tell? Please send me an e-mail. Give VUmeter to your friends! Download the program VUmeter now. The program is free. You may try the program without any risk; it can be simply removed from your computer ("Start | Configuration | Configuration window | VUmeter" => Click the Add/Remove Button). Use this method if you want to install VUmeter on a second computer. Click "OK" and downloading starts. The file "vumeter100.exe" will now be saved into the directory "c:\Temp". Now follow the directions in the setup program to install VUmeter on your computer.